1 Combine Hellmann's® or Best Foods® Real Mayonnaise with basil in small bowl with wire whisk; set aside. 2 Combine tomatoes with 1/4 cup dressing in medium bowl. Season, if desired, with salt and pepper; set aside. 3 Toss eggplant with remaining 1/4 cup dressing and grill, turning once, until golden brown and just cooked through, about 8 minutes. 4 Brush both sides of bread with 1/4 mayonnaise mixture, then grill, turning once, until lightly golden brown on both sides, about 2 minutes. 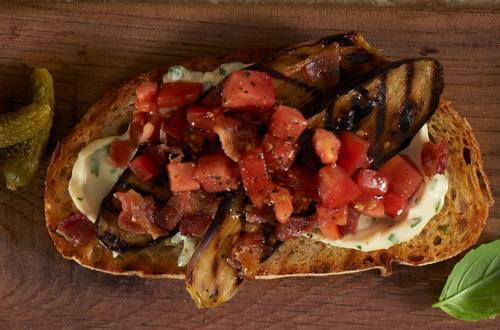 5 Evenly spread remaining Mayonnaise mixture on each slice of toasted bread, then evenly top with grilled eggplant and tomato relish. Sprinkle bacon.